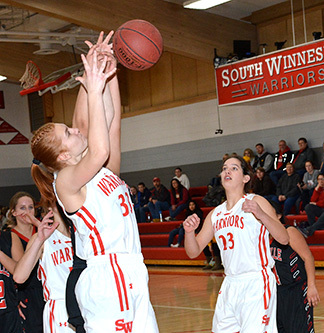 The South Winn girls’ basketball team never gave Postville a chance as it knocked off the Pirates, 66-17, in Calmar Saturday night. The Warriors take a 10-10 record into the Region 4 quarterfinals today, Tuesday, Feb. 12, in Monona against MFL MarMac (20-1). Postville concludes the season 1-18. In Saturday’s opening playoff game, SW rang up a 22-2 lead after the first eight minutes. In the second quarter, the Warriors allowed the Pirates to score four points and had the game firmly in hand, 45-6, going into the locker room. In the second half, the home team slowed the scoring as the starters sat for more than a quarter, allowing the Pirates to earn 11 points, while South Winn found the basket for 21. Should the Warriors squeeze past the Bulldogs, they will advance to take on either Cascade or Belle Plaine in the semifinals Friday, Feb. 15, at 7 p.m. in Cascade.